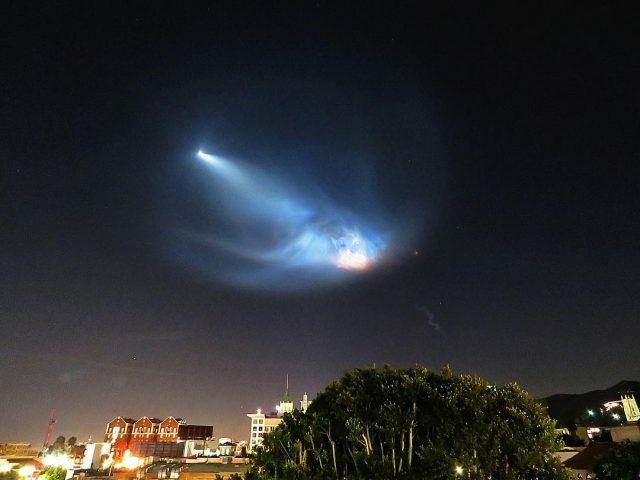 Random LA: SpaceX Freaks Everyone Out! Tonight Elon Musk’s SpaceX launched their first satellite into space on the Falcon 9 rocket from Vandenberg Air Force Base at around 7:20 PM, blowing everyone’s minds with a bizarre lightshow that looked like a nebula, a UFO, or one of the ghost whales from Centipede, depending on your vantage point. Most social media users knew what was happening, but a good number of people were totally freaked out, having no idea what they were seeing. This entry was posted in Miscellanious, Science & Technology. Bookmark the permalink.